A few weeks ago, I read a post on my favorite weblog by swissmiss. 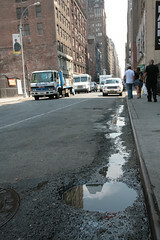 The article concerned a initiative by the people of New York documenting non-emergency 311 conditions throughout New York City. The people of 311 encourage citizens to post photos here of dangling traffic signs, illegal advertising, dead or dying street trees and the like, along with their locations. People’s 311 is an unofficial companion to 311.